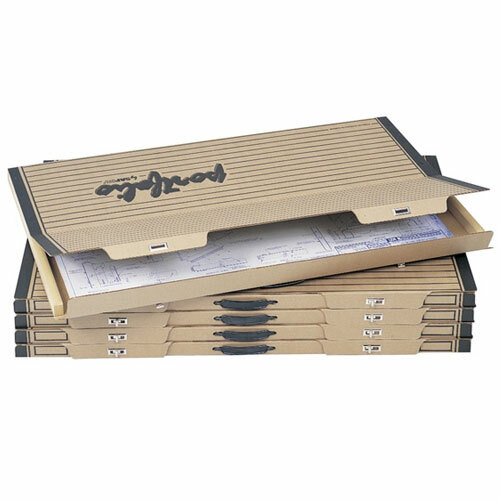 The Safco 3008TS - Art & Drawing Portfolio is a great way to easily carry heavy, bulky documents or conveniently stack them for storage These are great for storing blueprints, drawings, posters, and artwork, or any large document. These are made with long-lasting heavy-duty corrugated construction with reinforced plastic handle and a sturdy 3/4" x 1-1/2" wood frame. The top opens wide for a fast easy search and retrieval of contents; closes securely with metal turnbuckles. Shipped fully assembled. Exterior is Tropic Sand with Black graphics. Packaged and sold 5 portfolios to a carton. Holds up to 36-1/2" x 24-1/4" documents. Outside Dimensions: 38-1/8" x 24-3/4" x 1-1/2"